← The Supremes – Where Did Our Love Go…I think I force these breakups just to makeup again. Listened to the Kingsmen singing Louie Louie on the radio, tried to figure out the dirty words. Today was the most bitchen day of the year. It was 85 degrees. We’re going to ditch school maybe Thursday or Friday and go to the beach if it keeps up this way. After school today, I wanted to go to Toes, but we all planned to meet at the Wall in Santa Monica. When we arrived, Marilyn and I were the only girls there, everyone else went to Toes, like I thought. So we drove down there listening to the Kingsmen sing Louie Louie on the radio, trying to figure out the dirty words…. Got to Toes, but Howard or Dave weren’t there. Pam Hermanso wrote me a note, she didn’t tell Howard I hated him. He told her he was mad and didn’t talk to me because I didn’t talk to him. I think we’ll make up Saturday. Ordered about $15.00 worth of Saffron Club pictures. Got to give one to Howard. They are so Bitchen!! 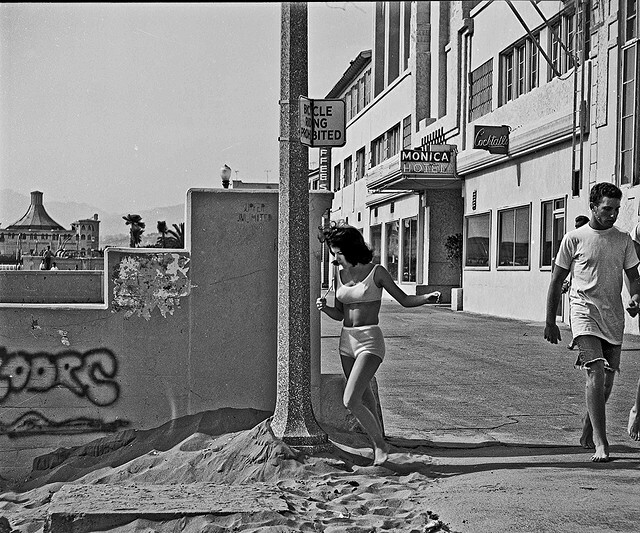 The WALL at Santa Monica Beach, 1964. We would play the record slow motion on the record player, trying to figure out what they were saying. We thought it said, I banged her all night long and soon a baby will come along, Boy did we have dirty minds, here are the real words. This entry was posted in 1960's Surf Culture, 1964 High School Diary, diary, memoir, Southern California 1964 and tagged 1964, Beach, Culver City, Culver High School, dirty words, ditching school, going steady, Kingsmen Louie Louie 1963, making-out, Maybelline, Maybelline Story, Saffrons Rule, Sharrie Williams, Southern California, Surfer's Rule, teenagers, The Wall in Santa Monica, Toes in Playa Del Rey, United States, West Side Surfers, Westchester High School. Bookmark the permalink.